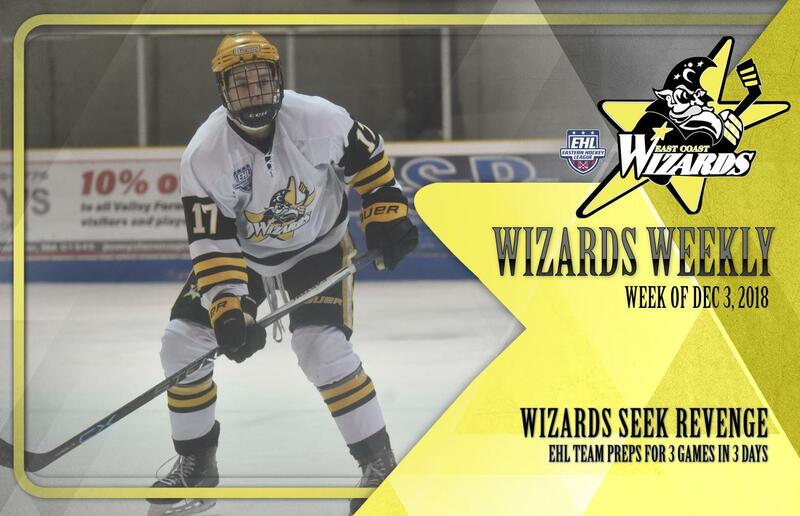 BEDFORD, MA -- The East Coast Wizards returned to action this past week, with matchups against the Seahawks Hockey Club and the Walpole Express. Unfortunately for the Wizards the time off for Thanksgiving was very apparent in a 7-0 loss to the Seahawks (Wednesday), but the boys did bounce back with a 2-1 victory over the Express (Friday). "We were definitely rusty in that game against the Seahawks," said Wizards head coach and general manager Freddy Meyer. "That was by no means the reason why we got shutout the way that we did though. The Seahawks are a darn good team, and they showed our guys exactly why they are in 1st place." It's well-known how long the season is in junior hockey, and the Wizards still have plenty of time left to better their spot in the New England Conference. Heading into a new week the Wizards own a mark of 12-7-1, and if the playoffs started today, that would make them the 5th seed in the playoffs. The week ahead features 3 games in 3 days, starting with the Vermont Lumberjacks tomorrow afternoon. The Wizards won the first matchup 3-2 on October 23rd, and tomorrow gives the team a chance at the regular season sweep. Flip over to Thursday, and the Wizards get a quick chance at revenge against the Seahawks. This week's matchup is the first between the two teams at The Edge Sports Center. Finally, the Wizards will wrap up the week with a playoff rematch against the New Hampshire Avalanche on Friday.